Lonzo Anderson Ball (born October 27, 1997) is an American college basketball player for the UCLA Bruins. As a high school senior in 2016, he was awarded multiple national high school player of the year honors, and led his team to an undefeated record, as well as a national championship. He committed to play for UCLA starting in 2016–17. Ball was born near the Los Angeles metropolitan area in Anaheim, California, to Lavar and Tina Ball, who were both former college athletes. His parents both played college basketball. The 6-foot-6-inch (1.98 m) Lavar played at Washington State before transferring to Cal State Los Angeles, where the 6-foot (1.8 m) Tina was also playing. A two-sport star, Lavar also played American football professionally for the London Monarchs in the World League of American Football. Ball started playing basketball when he was two. He grew up with his younger brothers, LiAngelo and LaMelo. Until they reached high school, the trio played together on teams coached by their father. Ball attended high school at Chino Hills High School in Chino Hills, California. As a junior in 2014–15, he averaged 25 points, 11 rebounds, 9.1 assists, 5 blocks and 5 steals. In his senior year, he led the school to a 35–0 record and a state title, and the Huskies were ranked the consensus No. 1 team in the nation. His younger brothers, junior LiAngelo and freshman LaMelo, were also on the team. Ball averaged a triple-double with averages of 23.9 points, 11.3 rebounds and 11.7 assists per game. He received national honors including the Naismith Prep Player of the Year, Morgan Wootten National Player of the Year, USA Today Boys Basketball Player of the Year, and Mr. Basketball USA. 1 2 3 4 "Lonzo Ball". USA Basketball. Archived from the original on March 24, 2016. ↑ Meyer, Jerry (March 10, 2016). "Lonzo Ball wins Naismith Trophy". 247 Sports. Retrieved March 24, 2016. ↑ "UCLA-Bound Guard Lonzo Ball Named Naismith HS POY". Slam. March 10, 2016. Archived from the original on March 24, 2016. 1 2 3 Flores, Ronnie (April 25, 2016). "Mr. Basketball 2016: Lonzo Ball". CalHiSports.com. Archived from the original on April 26, 2016. 1 2 Stephens, Mitch (March 26, 2016). "The Architect: Father of the Ball brothers speaks about growth of Chino Hills". MaxPreps.com. ↑ Parrish, Gary (July 30, 2015). "The Ball family -- coming to a basketball court (and TV) near you". CBSSports.com. Archived from the original on April 26, 2016. ↑ Gardner, Michelle (November 25, 2015). "Talented Ball brothers bring entertaining brand of basketball to Inland Empire". Inland Valley Daily Bulletin. Retrieved June 2, 2016. ↑ Jordan, Jason (March 30, 2016). "McDonald's All American Lonzo Ball is finally proven, now he's focused on fun". USA Today. Archived from the original on April 26, 2016. ↑ Chau, Danny (June 1, 2016). "Be Like Steph?". The Ringer. Retrieved June 2, 2016. ↑ Conor, Ryan (January 18, 2016). 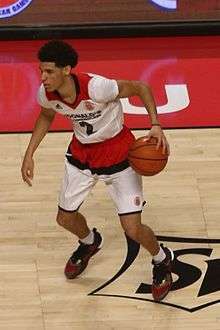 "Lonzo Ball, UCLA commit, wows at Hoophall Classic alongside brothers LiAngelo and LaMelo". The Springfield Republican. Archived from the original on March 24, 2016. ↑ "TWO POINT GUARDS EARN 2016 MORGAN WOOTTEN PLAYER OF THE YEAR AWARD" (PDF) (Press release). McDonald’s USA. March 9, 2016. Archived from the original on April 16, 2016. ↑ Halley, Jim (March 29, 2016). "ALL-USA Boys Basketball Player of the Year: Lonzo Ball, Chino Hills (Calif.)". USA Today. Archived from the original on April 26, 2016. ↑ Flores, Ronnie (May 20, 2016). "Lonzo Ball Named Mr. Basketball USA". Ballislife. Archived from the original on June 9, 2016. ↑ "Lonzo Ball". Verbal Commits. Archived from the original on May 24, 2016. ↑ Powers, Shad (January 2, 2016). "ALL-USA Watch: Is Chino Hills' Lonzo Ball the most complete player in nation?". USA Today. Archived from the original on March 24, 2016. ↑ Plaschke, Bill (March 12, 2016). "At Chino Hills, the Ball brothers produce a perfect mix of flash and class". Los Angeles Times. Archived from the original on March 24, 2016. 1 2 Sondheimer, Eric (April 2, 2016). "Chino Hills' Lonzo Ball is The Times' boys' basketball player of the year". Los Angeles Times. Archived from the original on May 20, 2016. 1 2 Guardabascio, Mike (April 30, 2016). "Lonzo Ball earns MVP honors at Ballislife All-American Game in Long Beach". Long Beach Press–Telegram. Archived from the original on May 19, 2016. ↑ Flores, Ronnie (April 25, 2016). "Mr. Basketball 2016: Lonzo Ball". CalHiSports.com. Archived from the original on April 26, 2016.